We all need a little luxury in our lives right? If your next luxury item is going to be an expensive toilet, then you’re in the right place. In this article, we will compare and review five of the best expensive toilets currently available. Buying a luxury item is one thing, but buying an expensive item just to find out it’s really not luxurious, it’s just expensive isn’t a good feeling. We hope by doing extensive research to bring you our top picks, we can stop that happening to you! Expensive toilets, while offering the best in comfort and design, are about so much more than looks. They use innovative technology to bring you the best in waste removal while being eco-friendly and saving you money on the copious amounts of water lesser models can waste. Are Expensive Toilets Worth It? Before we get into the particulars of each model, we have put together an at a glance comparison table so you can see some of the main features and things to consider about each of the five models we have chosen. This section will now expand on each of the models we have selected to give you a fuller picture of what each model is about. The Toto MS980CMG#01 Neorest 550 Toilet comes with a dual max flushing system which gives you the option of 0.9 gallon flush for liquid waste or a 1.6 gallon flush for solid waste. This option allows you to save even more water, making this toilet a good eco friendly option. This model comes with a remote control which can be used to open and shut the lid and also to set the temperature of the seat – no one wants to sit down on a cold seat! There is also a programmable night light, a three mode bidet function and this model comes with a hands free, automatic flush, meaning you don’t have to touch the flush button! The self cleaning bowl keeps the toilet hygienic and odour free and means it needs no abrasive chemicals. The Toto MS980CMG#01 Neorest 550 Toilet is the ideal choice for anyone who wants to be eco friendly but have all the mod cons. It’s an ideal choice for anyone who likes to have the latest in gadget technology. 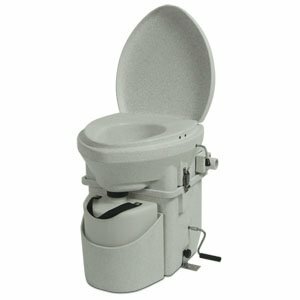 The Toto Ms970CEMFG#01 Toilet comes with dual max flushing system that is expected on Toto’s models. This toilet is so much more than just a toilet – it’s a bidet with a built in toilet. Perfect if the thought of a bidet excites you but you don’t have the space for one. This model comes with front and back water jets that can be adapted to suit your temperature wise and pressure wise. There is also an option for warm air to gently dry you. The light up remote control can be pre-programmed to store settings for two users. This model comes with an auto close lid and an auto flush, meaning you can use the toilet without having to touch any part of it and risk spreading germs. It also has an automatic air deodorizer which ensures there are no lingering odours in your bathroom. 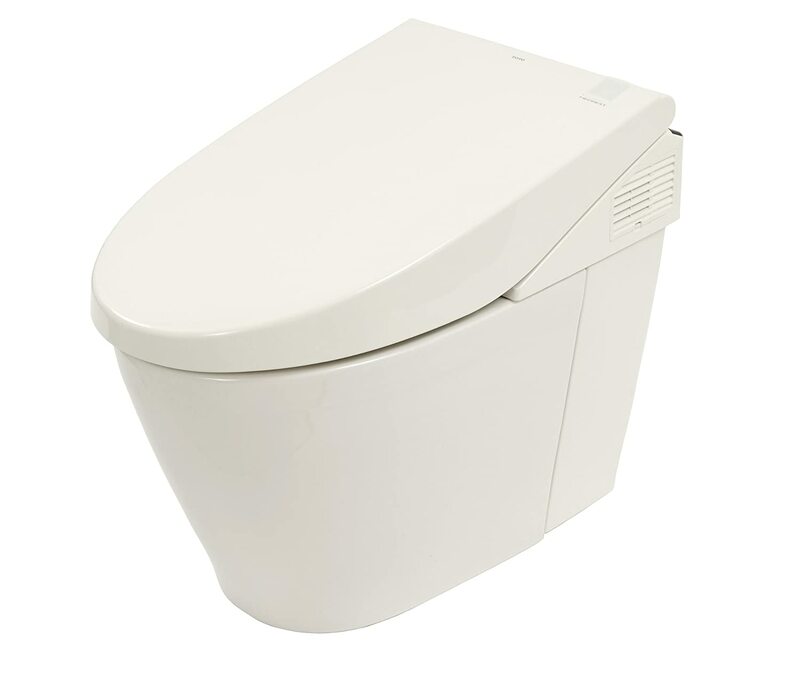 The Toto MS970CEMFG#01 Toilet is the ideal choice for anyone who wants the luxury of a bidet without wanting to use up the extra space it would take to have a separate one. The Kohler K-14247-FL-0 is more than just a toilet. It’s a work of art! 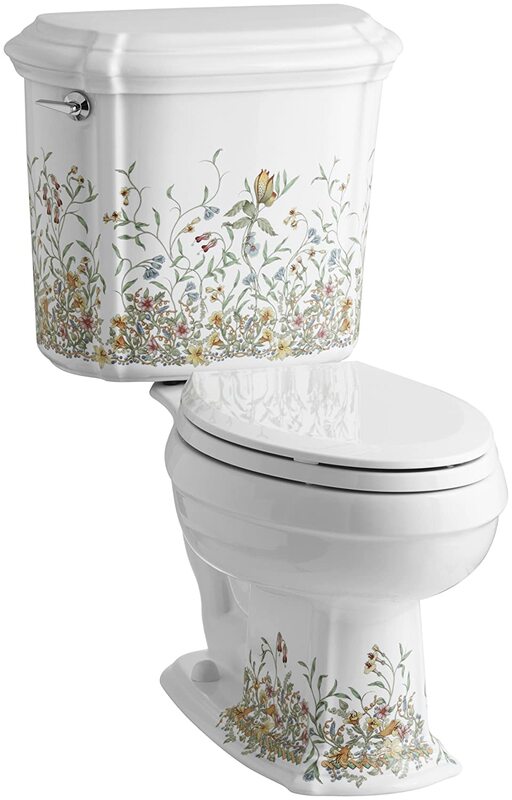 The design of this toilet sets a beautiful trellis floral pattern, interlaced with flowers, leaves and butterflies against a pristine white background. The design, inspired by English chintz patterns is located on both the bottom of the bowl and the tank, to make a truly remarkable piece. You would expect nothing less than a beautiful design from Kohler, but this toilet isn’t just pretty. The heightened, elongated bowl makes for a very comfortable sitting experience, and the toilet comes with Kohler’s Ingenuim flushing system. The is perfect for anyone who loves their bathroom, and wants it to be beautiful. This toilet is for anyone who is bored of the standard plain toilet and wants something different without compromising on quality and functionality. This is no novelty toilet – it’s an efficient toilet that just happens to look amazing too! The Nature’s Head Dry Composting Toilet with is a composting model that uses no water at all, making it a good choice for those concerned with saving water. This model is described as user friendly, and it’s quick and easy to install. The model comes with a 12V plug, but also has a crank handle that can be used instead of the electricity, or can be used in conjunction with it to speed up the composting process. This means that this toilet can be used as a standard toilet when hooked up to the electricity, or the crank handle can be used to manually compost. The toilet is odourless and lightweight. 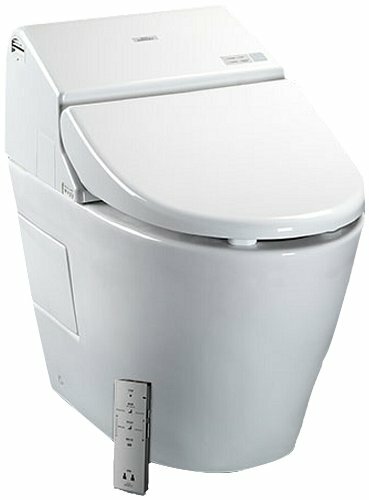 The design of this model of toilet is very close to normal flushing toilet design, with the only real difference being that the tank makes the bottom of the toilet a little bulkier than a standard U-bend. The Nature’s Head Dry Composting Toilet is ideal for anyone who wants to have a composting toilet while maintaining the look of a standard flushing toilet and who doesn’t want to have to deal with odours! The Nature’s Head Self Contained Composting Toilet comes with an inbuilt fan that refreshes the air in your bathroom, eliminating any odours quickly and efficiently. This model of composting toilet looks as close as you can get to a standard flushing toilet while still having all of the benefits of a natural toilet. 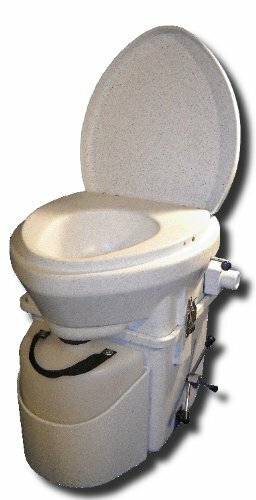 This model boasts an elongated, standard size seat making using this toilet much more comfortable than other models of composting toilets. The holding tank sits behind a sealable valve to prevent leakages and odours. The stainless steel hardware makes this model durable and easy to clean while not compromising on the look of the toilet. The Nature’s Head Self Contained Composting Toilet is ideal for anyone who wants the benefits of a composting toilet but doesn’t want to lose the comfort and design of a standard home toilet. That’s kind of a loaded question isn’t it? The reality of it is that maybe they are and maybe they aren’t. It depends on each individual person’s thoughts on their toilet. If you want an all singing all dancing toilet experience that is comfortable and with all the mod cons, then yes, expensive toilets are worth it. You’re unlikely to find a budget toilet with a heated seat, dual flushing that actually works, and an inbuilt washlet for example. If you’re someone who wants an experience, not just a function when you go to the bathroom, an expensive toilet can really make that happen. If you’re someone who isn’t particularly concerned with their bathroom’s design and you want something purely functional, then no, they aren’t worth it. If the idea of technology attached to your toilet makes you roll your ideas because you view the bathroom as somewhere to do your business and leave, then you are probably best suited to treating yourself a different way. We hope you enjoyed learning a little bit more about our top picks, and are now inspired to purchase your dream expensive toilet!